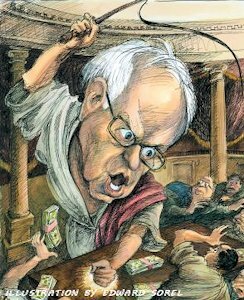 The "Bern" - labeled "The Populist Prophet" by New Yorker Magazine - has been railing against unfair "profits" and injustice on behalf of poor and working people his entire adult life. . . or maybe longer. . . who knows maybe from the cradle! 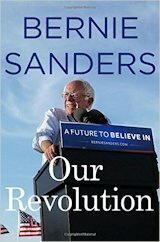 If the dictionary had a picture of an "Idealist" a good chance the 2016 edition would show Bernie's serious expression as he gesticulates a point he is making about the needed changes in government. . . something he has been doing ever since he was demonstrator and student activist while at the University of Chicago in the 1960s. This passion has remained unchanged for over fifty years, which to me signifies that the jung-myers mental process of Feeling judgment is at the center of his mental universe. 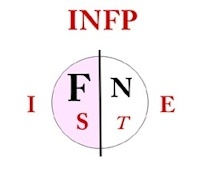 As Danielle Poirier has stated, INFPs are "intense and passionate about their values and deeply held beliefs." The People's Champion. Linda Berens characterizes INFPs as ". . . advocates and champions of causes, caring deeply about their goals and aspirations. . . ."
While most introverted personalities prefer a more quiet style of championing worthwhile causes (Former Presidential Candidate Ben Carson is a good example), remember all introverts have an extraverted nature. And some us are born with a predisposition to let that extraversion "out of its box" more frequently to carry out the mission assigned to it by that introverted core of being. Bernie is one these kinds of introverts, plus what we see now has been honed by being in one political office or another for over forty years. I remember one article where The Bern recalled his early days campaigning as the Liberty Union candidate for governor and one of his early radio interviews. Bernie said his knees were knocking so much he had to grab them in restraint. A situation most Introverts can relate to. Sanders, The Critic. Here is where Bernie's extraverted thinking appears to run the show. His Thinking is a sword in service of its master (Introverted Feeling), calling out those whose programs or actions are barriers to achieving the social justice he seeks. Years in politics have allowed Bernie to sharpen his use of logic and to be somewhat dispassionate in dispatching those on the "other side" of whatever he is championing. This extraverted side of Bernie has been so frequently exercised that it tends to shield his inner self. He's not very interested in talking about himself, his personal life, or letting out any significant degree of personal warmth in his one-to-one interactions. Sanders, The Philospher-Policy Wonk. The other mental partner in Bernie's extraverted nature is Intuition which is reflected in his adoption of broad-based political ideology. As a student he joined the Young People's Socialist Party. Later he ran for office under the banner of the Liberty Union Party. When finally elected Mayor of Burlington, Vermont he adopted the Socialist label, which later evolved into his identification of Democratic Socialism. Intuition also is reflected in his confidence in "knowing" the things he advocates are "right" without the need to re-examine them. His stances on various issues have been remarkably consistent over a long period of time. Intuition plus Thinking builds a strong foundation that is hard to crack. The Inner Bernie. As mentioned at the outset, his strong and fierce advocacy for so many different groups of folks who feel left out or abused, indicate his Feeling nature dominates his being. It is primarily internal or introverted, which allows him to use his Thinking (his sword) with the outside world. Were his Feeling nature primarily extraverted, The Bern would be much more adept at getting along with others of a variety of stripes and not near so strident. While Sanders adopts broad support for a number of causes and broad-based philosophical-political positions, he can attend to the details. His introverted Sensing allows him to speak before audiences for lengthy periods of time without notes or a teleprompter. While his lines are delivered in what appear to be an extemporaneous fashion, most are well-rehearsed and committed to memory where they can be drawn upon as needed. That inner Bernie combination of Sensing and Feeling would allow Bernie to be seen as human and approachable, a regular guy. Since his media presentation is only him with his political, activist hat on, we don't know "how alive" is this SF template. One of these days, he might let us see that nature. Sanders INFP CEO? If Bernie succeeds in winning the election, it will be interesting to learn about his leadership style. You rarely find INFPs as chief executives in larger enterprises. The hard decisions required of the job court disharmony and conflict that most INFPs find disagreeable. When they are in the top spot, they succeed by relying on their people skills, caring sensitivity and compassion to the needs of others. They build a loyal staff and provide an atmosphere for them to succeed . . . and thus the organization also succeeds. But as observed above in some ways Bernie is not your average INFP. I don't expect his leadership style to be archetypical of INFP. Through 50 years of being on the front lines of politics and social activism, he has developed the hard shell of a warrior. Unless he inherits a Congress who has equal passion for his causes and his desire to upset the status quo and powerful interests, I'd expect him to continue his strident advocacy - which isn't likely to succeed. While Bernie loves windmills (and alternative energy), he could follow the path of another INFP of poetic story and end up on his white horse jousting with them. But maybe he'll discover the power of his inner self (SF) to win friends and find harmonious and progressive solutions, making progress without waging war. As far as we know, his three seasons as Mayor of Burlington Vermont in the 1980s (population about 37,000) were successful. But Burlington is Pony League; can he succeed in the Major Leagues without at least some game time in the Minor Leagues? We may find out. Some argue Bernie is actually an INFJ type - see my post on this topic. Other Archetypal Preferences for President. In the last Presidential election, it was INFJ Architect Obama versus ISTJ Manager Romney. America chose the Architect. Trump, the ESTP Promoter and Developer, hasn't liked the Obama architectural plan nor the execution of it. He has a different vision of what America can be: "We can be great, again!" If he succeeds in getting the Republican nomination, he may be up against INTJ Director Hillary Clinton, who he sees as essentially adopting the Obama Screenplay but who will certainly put her own twist on it: "We can be whole, again!" Next Article, More Archetypal Choices. Trump's differences with Obama and Clinton also go to temperament. Introverted Intuitives have a quite different action orientation than Extraverted Sensors. Trump sees them as "low energy" and people who plod along, spending far too much time naval gazing and delaying action. They are not players, they are planners. They fiddle while Rome burns. Trump and Sanders do share a few views on political topics . . . Wall Street, Middle East War, respect for veterans, a few more perhaps. But if they meet, head to head I'd expect the battle lines to be drawn along ST vs NF lines: wealthy, scrooge business tycoon vs impractical, slightly treasonous, preacher-man. While Trump respects his former fellow competitor Ben Carson because of his competence in his field and his intelligence, he has some of the same instinctual aversion to Carson's low energy style which is clearly Introverted and reflects a cerebral Intuition (INTP Composer) - who unlike Sanders is a very good example of his archetype (INTP).